The top sports and leisure destination in Murcia, south-east Spain, which has been at the forefront of golf in Europe for more than 45 years, received double the number of votes of its nearest rival on its way to claiming one of the leading accolades at the 2019 Today’s Golfer Travel Awards. Voted for annually by readers of the UK’s best-selling golf magazine, the awards recognise the most prestigious golf venues in the UK and Europe, with La Manga Club winning the top honour in Spain every year since it was introduced. Eduardo Ruiz, general director of sports at La Manga Club, said: “To be named as the best resort in Spain for the last eight years is an incredible achievement, and is continued recognition for the key role La Manga Club has played in promoting golf travel across the UK and Europe. Kevin Brown, travel editor at Today’s Golfer magazine, said: “Some outstanding golf resorts have emerged in Spain and throughout Europe in recent times, but La Manga Club still remains the best of the bunch and the benchmark for the best part of half-a-century as far as our readers are concerned. 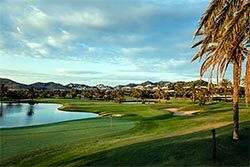 Nestling across 1,400 acres, La Manga Club is well-established as a firm favourite with golfers from the UK, Europe and beyond, with its extensive facilities including three acclaimed 18-hole golf courses, a nine-hole, par-47 academy course and first-class golf training centre. The latest honour to be bestowed on the resort means that it has started the new year in the same award-winning fashion that it ended 2018. La Manga Club was crowned as ‘Europe’s Best Golf Venue’ and ‘Spain’s Best Golf Hotel’ for the second year running this winter at the annual World Golf Awards, while other notable achievements included being voted ‘Europe’s Leading Sports Resort’ at the 2018 World Travel Awards. The official overseas training base of the Lawn Tennis Association (LTA), the resort’s other facilities include a 28-court tennis centre and 2,000sqm spa and fitness centre, while the resort is the host to Spain’s only official Chelsea FC Foundation Soccer School. In addition, La Manga Club features the choice of a five-star hotel, four-star serviced apartments and townhouses and more than 15 bars and restaurants. Located in a magnificent natural environment next to Calblanque National Park and the Mediterranean Sea, with a mild year-round climate and enjoying exceptional security and privacy, the exclusive resort of La Manga Club (Los Belones, Cartagena, Murcia) offers luxury, leisure and sport in the same place, and is set just 20 minutes from Murcia airport, a 30-minute drive from the city’s new Corvera airport – which opens in January 2019 – and is an hour away from Alicante. ounded in 1972, the resort now covers an area of 566 hectares containing accommodation, professional sports facilities, relaxation zones, first-class real estate and a private community of 2,300 residents, in a region which boasts more than 350 days’ of sun and is surrounded by natural parks and untouched beaches.